Stuart Katchis, M.D. is a leader in the treatment of flat foot and has more than 20 years of experience helping patients get back on their feet, pain-free. Whether your condition has just recently developed and can be effectively treated with nonsurgical options, or it is more advanced and requires surgery, Extend Orthopedics will plan and implement a comprehensive treatment plan tailored to your unique condition. 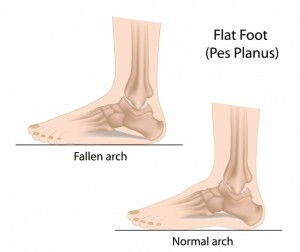 Flat foot is a condition characterized by a partial or total collapse of the arch on the inside of the foot. It is a condition that can vary in severity and develop at different stages of life, from childhood to adulthood. Flat foot can be caused by a number of factors and, depending on age, it may be a perfectly normal condition that resolves itself with time. It is common to notice flat foot in young children because their arches have not yet developed. Arches typically develop during childhood as the tissues along the bottom of the feet tighten, but if you have a different foot structure you may never develop arches. In other cases, flat foot might occur due to an injury or as a result of wear and tear over time. When the tendons in the foot that support the arch are weakened, the arch can gradually fall. What are the types of flat foot? Flexible flat foot describes the condition when a foot is still moveable and the arch typically reappears when no weight is being applied to the foot. This type of flat foot is common in children. Rigid flat foot describes the condition when a foot has become stiff and is fixed in a flat position even when no weight is being applied to it. In some cases, you may have no painful symptoms at all and treatment is not necessary. What are the risk factors for flat foot? If you are experiencing persistent pain or swelling around the arch or notice a progressive flattening of the arch, call our office at 212‑434‑4920 or fill out the schedule appointment form on this page so Stuart Katchis, M.D. can evaluate and diagnose your condition. Treatment for flat foot is only necessary if the condition is causing painful symptoms. Inserts placed in the shoes that raise and support the arches may considerably help to relieve pain and improve symptoms. Shoes with supportive soles should be worn at all times in lieu of sandals or shoes that offer minimal support. A brace can provide extra support and stabilization for a foot with weakened ligaments in the arch. Shedding extra pounds can reduce the pressure exerted on the feet and may improve flat foot symptoms. There are a number of stretches and strengthening exercises that may help improve flat foot symptoms, such as stretching the Achilles tendon. Dr. Katchis may recommend that patients see a physical therapist for treatment. Surgery may be required if nonsurgical treatments have not proven effective for improving symptoms and relieving pain. The type of surgical procedure recommended by Stuart Katchis, M.D. will depend upon each patient’s unique situation. The overarching goal of performing flat foot surgery is to improve the alignment of the foot so that pressure is equalized and everyday movements like standing and walking are not painful. Sometimes multiple procedures are necessary to achieve optimal results for a patient. Types of surgery performed may include repairing, rerouting (transferring) or lengthening tendons that support the arch. Bone cuts or arthrodesis (fusion) procedures may be also required. Surgical treatment for flat foot involves several weeks or months of recovery depending on the type of surgery performed. With any type of surgery for this condition, it will require you to wear a cast to immobilize the foot while the ligaments and bones heal. Whether you undergo nonsurgical or surgical treatment for flat foot, Dr. Katchis will provide recommendations for long-term measures designed to keep your symptoms from returning, such as footwear modifications and orthotics.